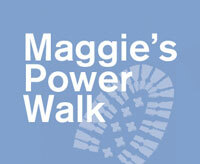 Maggies Power Walk: Saturday 8 June 2013 - Warm-up by HA fitness! 1) It's for an amazing charity. Maggie’s Centres provide emotional, practical and social support to people with cancer & their families & friends. 2) It's just £35 to sign-up, which you can do online. There's no fundraising commitment, just raise as much as you can. 3) It's a beautiful scenic walk, which will help you to burn calories & get fit. 4) I will be doing the warm-up at the start! Go to the Maggies website for more info & to sign-up. Hope to see you there!